SAN FRANCISCO, CA--(Marketwire - February 12, 2010) - According to a new study by the Yale-Griffin Prevention Research Center and just published in the February issue of Diabetes Care, eating 2 ounces of walnuts per day as part of a normal diet may improve cardiovascular health in people with type 2 diabetes. Prior studies have demonstrated the potential benefit of walnuts in promoting heart health in healthy adults, but none have investigated the effect of walnuts on endothelial function -- a measure of how well blood vessels are able to dilate and increase flow, and a powerful predictor of overall cardiovascular risk -- in adults with type 2 diabetes. The study participants -- adults with type 2 diabetes -- were instructed to eat 2 ounces of walnuts each day along with their normal diets during one 8-week period, and to simply follow their normal diets during another 8-week period. The order in which they followed the diets was randomly assigned, with an 8-week "washout" period in between. The research team found that endothelial function improved significantly when people consumed the walnut-enriched diet for 8 weeks. This is the first study looking at the benefits of walnut consumption on endothelial function in type 2 diabetes. "What we saw is exactly what we predicted we would see -- a significant improvement in the overall cardiac risk profile of the participants when they ate walnuts every day. Their blood vessels were happier, they dilated better, there was a significant improvement in endothelial function," said Dr. David Katz, the principal investigator. The researchers believe that the improvement seen in these individuals may be a result of the unique nutritional profile of walnuts. Walnuts are one of the best plant sources of alpha-linolenic acid (ALA), the plant based omega-3 fatty acid, and provide numerous antioxidants, protein, fiber, vitamins and minerals. 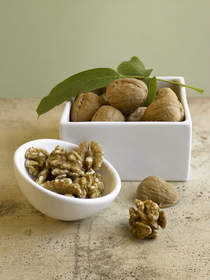 Two ounces of walnuts, the amount used in this study, contains approximately 350 calories. Interestingly, participants did not gain weight, indicating that even people at risk of weight gain can make room for walnuts, and their benefits, in their daily diets. This study was funded primarily by the California Walnut Commission with supportive funding from the Centers for Disease Control and Prevention. Video is provided by California Walnut Commission. "Effects of Walnut Consumption on Endothelial Function in Type 2 Diabetic Subjects"